LOS ANGELES, CA.--J-Pop promoters Nameless Group & Tune in Tokyo has teamed up with, Xenon Shop (Upcoming New Japan's 109-Hans style Apparel Shop) and Cure Magazine to present two nights of Japanese Idols andVisual-Kei live in Little Tokyo! Los Angeles Idol and VK Fest is coming toNirvana Bar & Grill, with music and fashion straight from Japan! 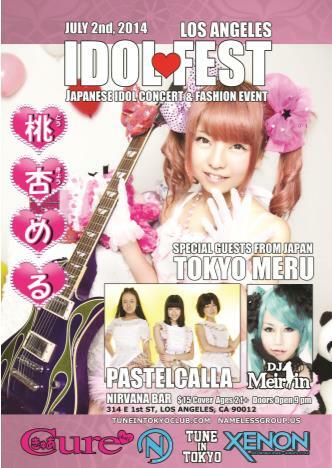 Los Angeles IdolFest will be held on Wednesday, July 2nd and features special guests from Japan: Tokyo Meru, Houkago Princess subunit Pastel Calla, and DJ Meirlin and CHII SAKURABI! Cover for the event is $15 (separate charge foreach night). Presale tickets available soon! Nirvana is 21+. Hours for LosAngeles Idol Fest will be 9 PM – 2 AM.